When you think about Super Bowl ads, what comes to mind is a one-off, larger-than-life spot that a brand uses to get a big hit before they return to their regular ad campaigns. However, that’s not how Yellow Tail Wine sees it. For the third year in a row, the company debuted an ad during the Super Bowl that it plans to use in a much bigger way. The new “Tastes Like Happy” ad campaign featured two entirely fan-produced video segments. Last November, the wine brand kicked off a contest asking fans to submit a six-second video of what “happy” tastes like to them. 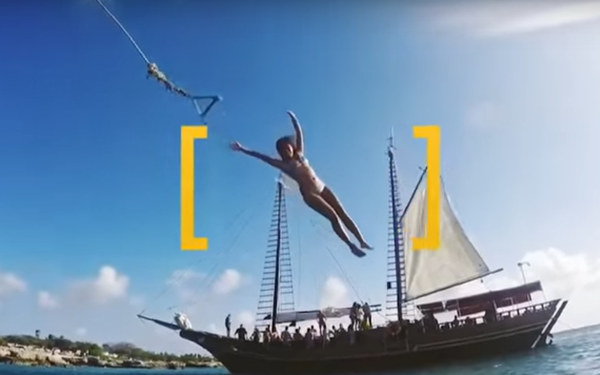 In the ad (shown below), the Grand Prize winner can be seen dancing the salsa on a beach, while the runner-up is seen swinging from a rope off a boat in Aruba during her honeymoon. In addition to the TV spot, the campaign includes digital advertising, social media, videos, sampling in-store and themed in-store POS. Iain Douglas, CMO, Deutsch Family Wine & Spirits, the makers of Yellow Tail, sees “Tastes Like Happy” more as a movement about happiness than an ad campaign. “This year is different than the past years, where we were more about fun and using mascots like the Roo and the Yellow Tail guy,” he noted. The brand decided to extend the time and exposure for this campaign before and after the Super Bowl window. The campaign’s focus was on incorporating user-generated content -- a marketing tactic it’s used before. However, this is the first time the brand has tried it on such a large scale. This approach seems to be working well for Yellow Tail, which is the most followed wine brand on social media and the most popular imported wine brand in America, according to the company. The brand has provided many lessons here. First, ads shouldn’t just be planned for one big event like the Super Bowl, but for a larger purpose that extends the value of the message they deliver. Second, the theme of the campaign should be something that adds to the larger set of values the brand represents, connecting on an emotional level with the audience. Finally, by encouraging this emotional connection, it’s easier to get the audience to provide beneficial user-generated content that amplifies an overarching campaign theme.